Athletes for a Better World (ABW) and The National Interscholastic Athletic Administrators Association (NIAAA) have formed a partnership to annually recognize one male and one female national NIAAA scholarship winner as automatic recipients of the prestigious Coach Wooden Citizenship Cup. These two high school athletes will join one collegiate winner and a professional recipient each year as exemplary role models of the ABW Code for Living. The inaugural recipients of the high school class of 2016 are Erin Houchins and Ian Saum who will receive the Coach Wooden Citizenship Cup on April 11, 2017 at the Atlanta banquet. ABW Executive Director Brad Catherman and NIAAA Executive Director Mike Blackburn celebrated this achievement with the two recipients at the Opening General Session of the National Athletic Directors Conference, conducted from December 10 through 13 at the Gaylord Opryland Resort and Convention Center in Nashville, Tennessee. 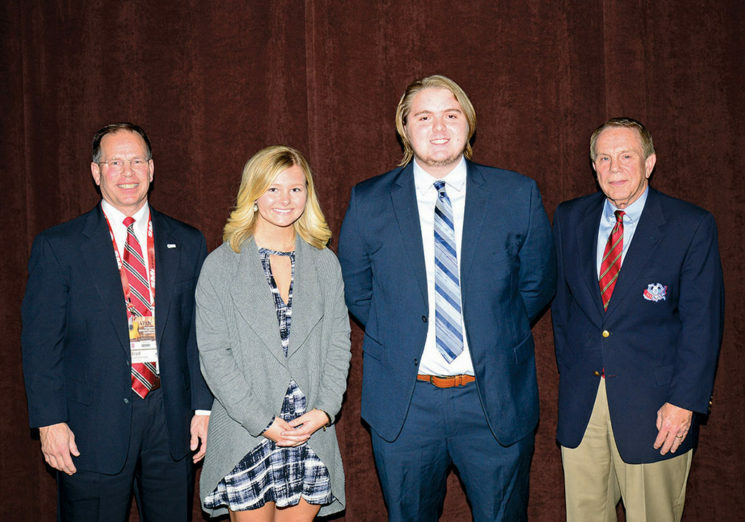 The NIAAA Student Scholarship/Essay competition recognizes distinguished high school student athletes in the attribute areas of scholastics, leadership, citizenship, participation, volunteerism and the importance of school sports participation in the student’s life. The ABW Code for Living criteria have been incorporated into the scholarship application by asking applicants to reflect upon the tenets of life lessons learned through sport and how they relate and impact their life. The ABW book entitled Winning More Than the Game challenges readers to consider the Code for Living via exercises, as a springboard for life qualities of character development. Students from 50 state athletic administrator associations, plus the District of Columbia, were able to submit a nomination form and essay. The male and female winners were then screened by one of the eight Sections in which their state resides, creating eight male and eight female Section winners. The NIAAA Board of Directors then evaluated the finalist’s scholastic record, athletic participation accomplishments, citizenship and leadership credentials on its way to selecting one male and one female national recipient. Both recipients were on hand in Nashville to receive their national scholarship of $2500, a personal trophy, a plaque for their high school and to read their winner essay entitled How High School Athletics Have Impacted My Life. The total scholarship earned by the two national recipients was $4000. Erin’s parents are Larry Houchens and Traci Houchens. Erin graduated from Warren East High School in Bowling Green, Kentucky with a grade point average of 4.13 on a 4.0 scale. She is attending the University of Louisville studying Exercise Science/Health and Human Performance with an emphasis in Physical Therapy. The Athletic Director at Warren East High School is Jonathan Vincent, CAA. Erin earned ten varsity letters in her high school career playing the sports of basketball and fast-pitch softball. She was captain of each of these teams during her junior and senior seasons. Erin was very active in her school as president of Beta Club, Class Secretary, and a member of Future Business Leaders of America, National Honor Society and the Fellowship of Christian Athletes. In the community, Erin was a volunteer working with elementary students; she worked with veterinary services as a volunteer, donated time for a local nursing home and assisted with youth sport instruction. She participated in angel tree ministry, food drives and clean-up days, while also assisting staff in the annual book fair event. Ian is the son of Paula Mehmel, and the late Steven Saum. He graduated with a grade point average of 4.0 on a scale of 4.0. Ian is attending Harvard University with a dual major in Sociology and Women’s, Gender & Sexuality Studies. The athletic director at Central Cass High School is Travis Lemar. Ian earned 9 varsity letters participating in football, track, and baseball, while also serving as team manager for the basketball team. He was class president, student council representative, editor of the school newspaper and a Wendy’s Heisman National Finalist. Ian was involved in band, choir, speech and theatre, while participating in the Fellowship of Christian Athletes and attending North Dakota Boys State. Scholastically, Ian was academic all-state, a nominee for the US Presidential Scholar from North Dakota and the recipient of numerous awards in journalism, science and fine arts. Ian’s community activities included youth sport volunteer, helping through church, nursing home and organizations for the homeless in areas that included a children’s Christmas party, fundraising, serving meals, vacation Bible school, food drives, blood drives and relay for life. About the NIAAA: The NIAAA is based in Indianapolis, Indiana, and is the national leadership organization for high school and middle school athletic administrators. With current individual membership of over 10,000 the NIAAA consists of athletic administrators from associations in the 50 states, the District of Columbia and Internationally. The NIAAA leads in providing professional development for athletic administrators, serving as a resource and provider of safe and plentiful participation opportunities for the nation’s 7.9 million student-athletes. With conducting education-based athletic programs as the focus, NIAAA membership provides opportunity for professional development, education, certification, national award recognition and exchange of ideas with athletic administrators throughout the world.